The Beaufort Range has many worthy hiking peaks. Mount Hal is a mountain suitable for anyone capable of the long distance. 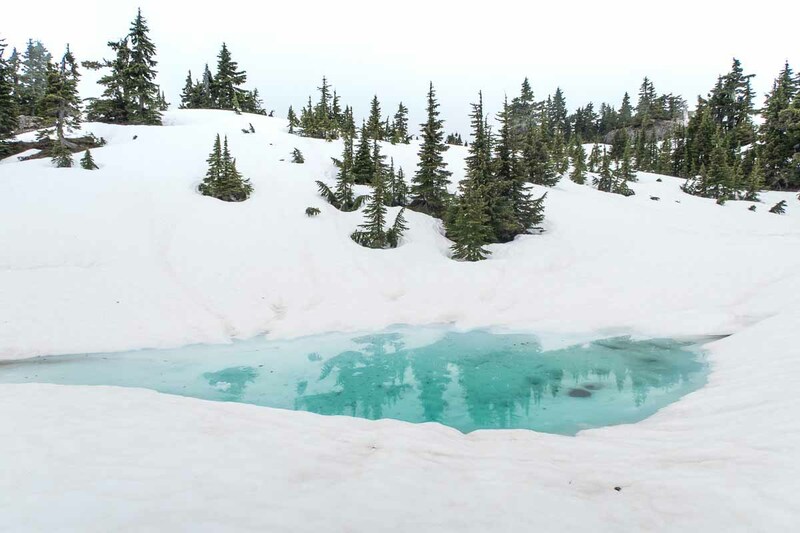 The Beaufort Range is one of the most picturesque low-alpine ridges on Vancouver Island. On my Island Alpine Quest, it’s one of my favourite regions to visit. I’m never disappointed! The long rolling ridge meanders identifiable peaks, around alpine lakes, and skirts a few bluffs. From Mount Joan’s summit, the highest peak in the range, I can see Port Alberni to the west and Comox Valley in the east. It’s a geographical division that forms the boundary between the two regional districts. It’s also a hikers dream. For someone adventurous enough, it’s possible to connect the series of peaks together in a long chain. 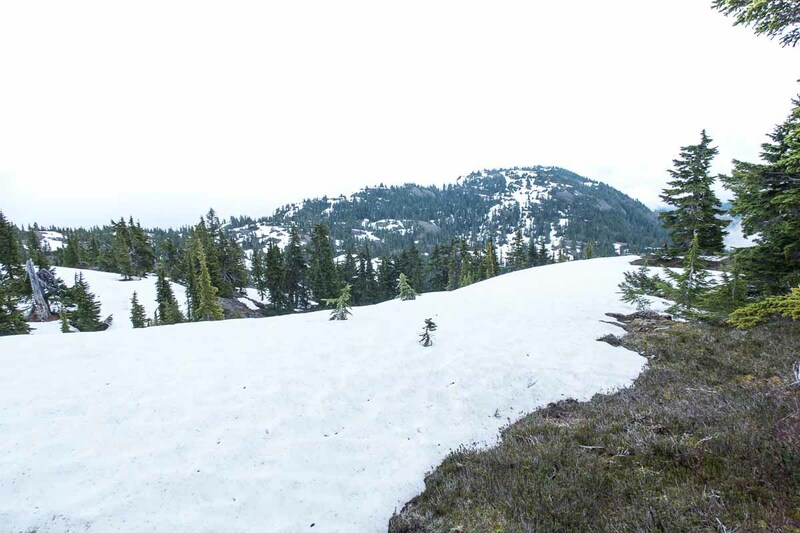 It’s this traverse that captured the attention of the Vancouver Island Spine Trail Association (VISTA). Their goal is to connect the series of existing trails to form one long system that makes it possible to hike the length of the island! It’s that goal which brought me back to the Beauforts, on May 24th. Today, I followed along with two other hikers, all three of us are volunteers of the Vancouver Island Spine Trail Association. The association has a long-term goal of unifying existing trails and routes to create a 700 kilometre thru-hike. We hiked as a group of three VISTA volunteers with Dave being in the lead. In the late nineteen-eighties, he summited Mount Joan from Port Alberni’s Log Train Trail. 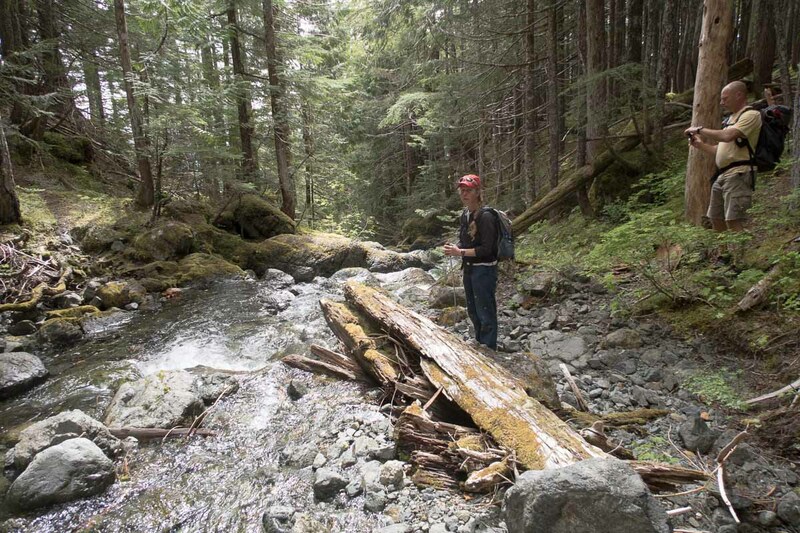 He remembered the approximate location of the trail, but we were worried the extensive logging over the past three decades had destroyed the trail head and maybe the entire trail. Still we searched for the remnants. We came prepared for a bush bash. Gators, sturdy clothing, and clippers at the ready we walked south-east down the Log Train Trail from the Woosely Road gate at 7am. As we walked we looked to the ridge high above, hoping for a glimpse of the mountain tops through the low hanging morning fog. At the four-kilometre marker we turned up a newer logging road to explore the slopes higher up. Dave examined many side spurs and short dead-end trails as we ascended the road. Eventually the road came to an end with a clearcut on either side. 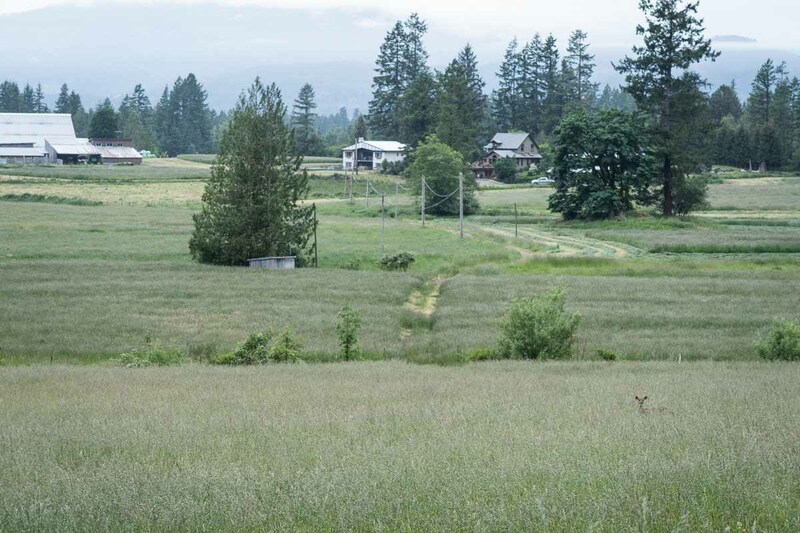 We looked up the hill, the bluffs above the clearcut looked uninviting and we considered our options: Try a different route closer to Mount Joan, or explore a potential route up to Mount Hal. We picked Mount Hal, being a closer objective from our position. Looking around, we could see another section of cutblock through a thin band of trees to the south. We explored around hoping to intersect a section of logging road indicated on my map. How fortunate we did! Immediately at the end of the new logging road we stepped onto what I can only call a trail. Not a rough shambles of an old logging road, but a beautiful, well booted, trimmed trail. 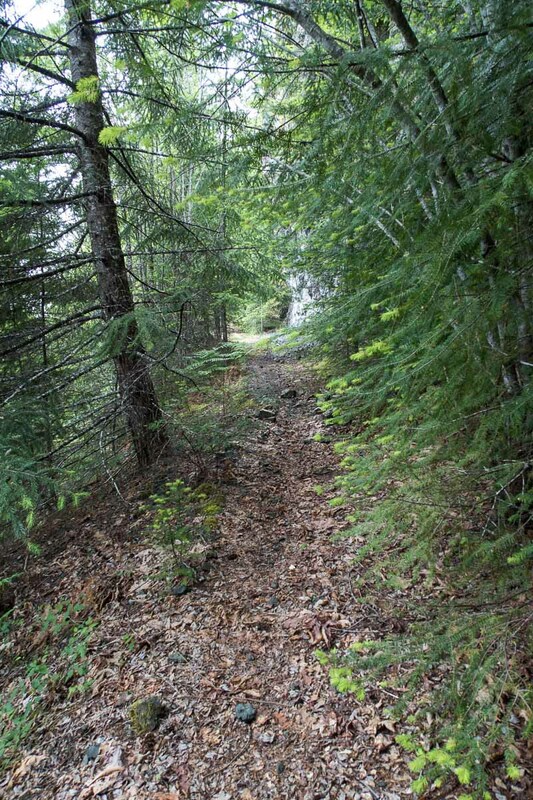 It’s obvious that at one time this trail was a logging road. As we walked I could see that we were walking the section marked as road on my map. It was a perfect day for hiking. The clouded sky obscured the sun, keeping the temperature down. Though the dense canopy of trees and low cloud denied us any chance of a view. It didn’t bother us, were on a mission! As the route climbed we identified a number of locations for small camps. There were even a few small fire pits and a water source. We hiked easily, seldom referring to our maps. As we switched back and forth up the well-graded slope we stopped and examined the abundance of orchids. Eventually, we gained a lower section of the ridge and the route was obscured by snow. We looked for an obvious route up the bluffs on our left, to the summit of Mount Hal. But if there was an easy route it was hidden. We had a route walked by a previous party and we compared it to our topo maps. We pushed through the light bush, and ascended up a shallow, narrow watercourse. Within a few minutes we popped out onto the wide summit. Mount Hal’s broad summit ridge was covered in consolidated snow with only the dark forms of alpine fir punching through the snow here and there. As we walked, the blowing clouds created an atmosphere of mystery which was reinforced by the turquoise blue of a melting alpine tarn. We reached the summit just before lunch, but we didn’t stop. I wanted to explore the north-west toe of the ridge, where the route would drop a few hundred metres to a saddle below. We didn’t quite make it as far as I would have liked. I couldn’t get a great view of the drop-off. Assuredly, it is walking down a steep slope through trees. However, it needs more exploration before I can confirm this would be a good backpacker’s route across the Beauforts. We returned to the summit, ate our lunch and talked about the fantastic trail! The two even treated me to some delicious homemade dessert! We were each invigorated by what we found. Dave was confident that this was the peak he visited, all those years ago. He even remembered the features along the trail. I understand how he may have thought he was at Mount Joan. When we come to an unfamiliar place, and someone provides its name, we believe that is where we are. In terms of backpacker’s route from the sea to the alpine it’s ideal. However, it would certainly not be the most efficient way to get to Mount Joan. There are nearly 6 kilometres of ridge to walk between Mount Hal and Mount Joan and a significant elevation gain/loss between the two peaks. It may be more efficient to walk the length of the log train trail and use an alternative route up to Mount Joan, but that’s an adventure for another time. As we left the summit I examined my GPS and was shocked to discover that we had covered 15 kilometres! The grade was so easy and we were so focused that I barely noticed the elevation gain and the distance covered! We set off with a spring in our step, the day’s achievement still fresh in my mind. As a closing thought, if you do intend to do the traverse be prepared for a few sections of steep forest and some minor scrambling, and bring maps and compass as there is no booted route connecting them.